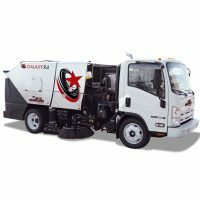 The CHARGE system comes with an in-cab control that fits conveniently inside a cup holder. Quickly turn each piece of equipment on/off with the click of a switch. Monitor each piece of equipment, its output and/or activity on the LED display. 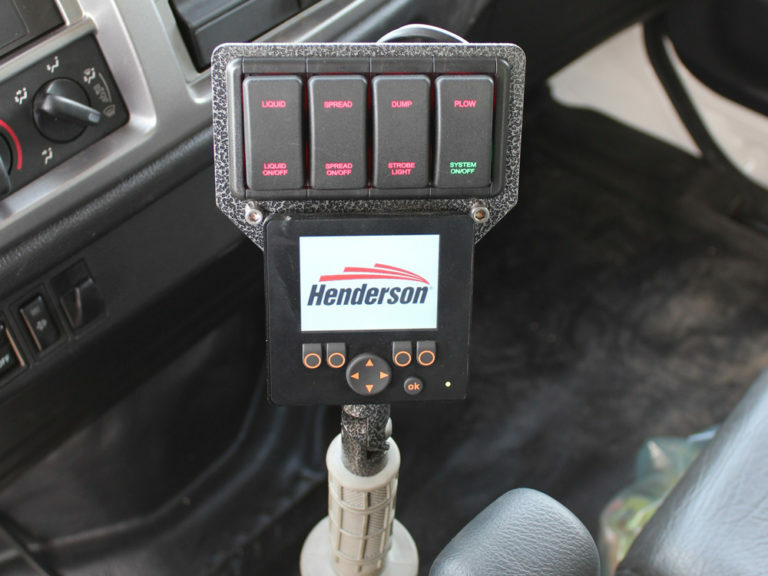 And finally, the soft touch controls allow for precision adjustments without ever leaving the cab. Soft button thumbwheel type control directs up/down left/right. 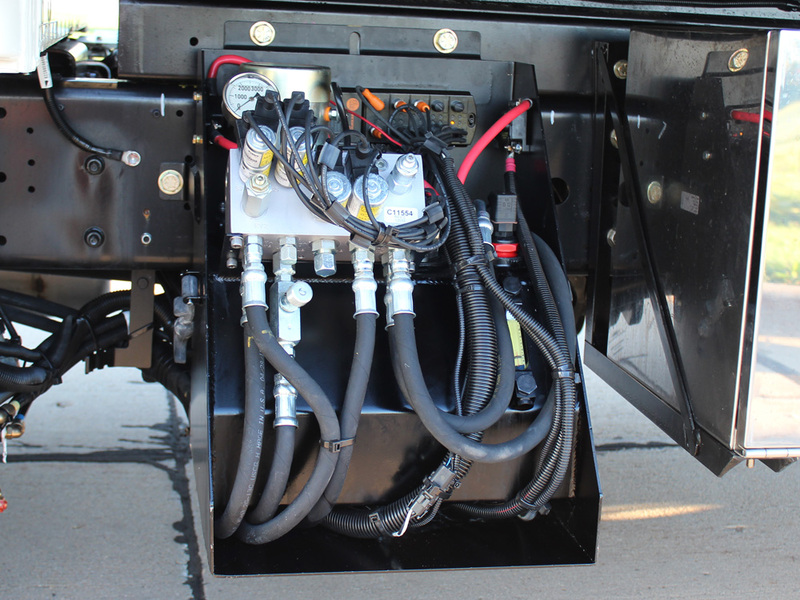 Speed and pressures of pump are optimized for cylinders used on Henderson’s MTP (medium-duty trip-edge plow), MTP Flex (flexible medium-duty trip-edge plow) or the MSP (mid-sized snow plow) as part of this unique electric control package. 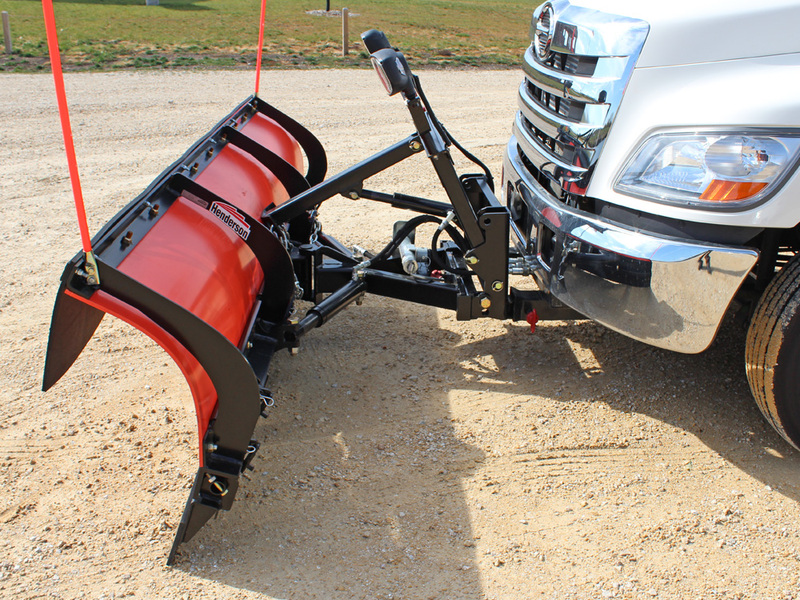 Dual button safety lock protects user from accidental motion of dump, yet are easily maneuvered during plowing. Electric motor/pump combination is designed to allow high flow at low pressure and still keep amperage low for telescopic hoist or lower flows at high pressure to allow good control on underbody hoists. Double acting hoists or first stage double acting cylinders work smoothly with less pump wear. Custom designed unit requires little setup. 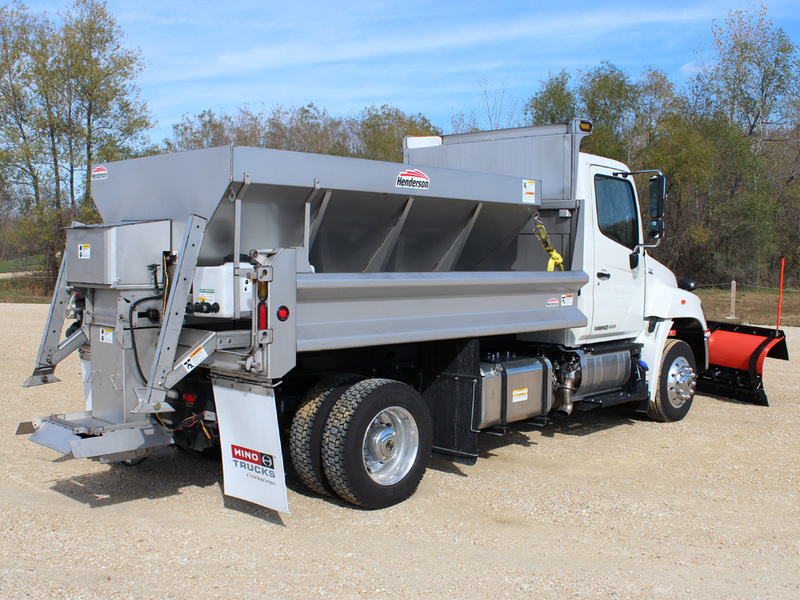 Since the unit is designed specifically for Henderson spreaders it only requires a few inputs during installation to become fully operational. 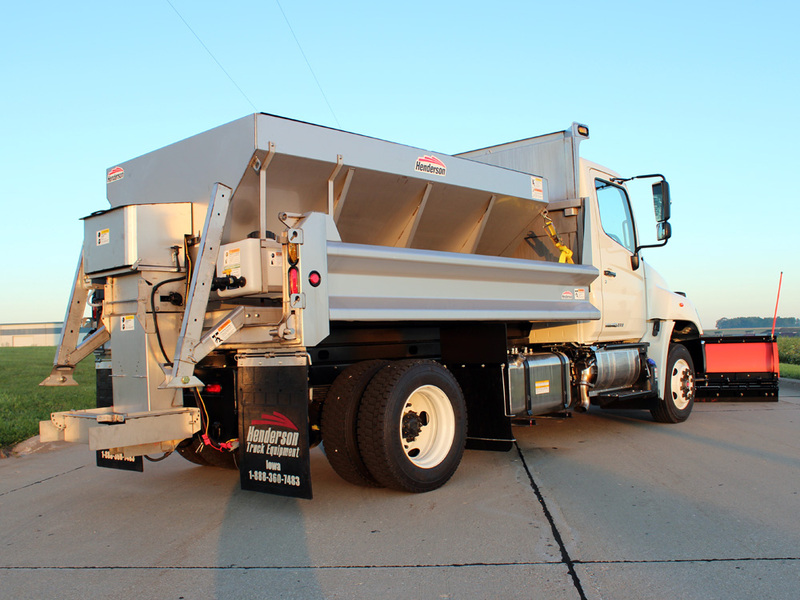 Adding an optional GPS sensor or other speed input device to the 12v dc driven spreader allows for ground speed interrupt or proportional ground speed control of spreading functions. 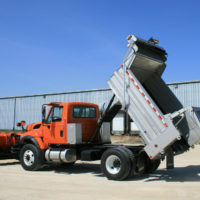 Liquid pre-wet follows the conveyor speed to maintain a constant mixture regardless of truck or conveyor speed changes. Blast function for intersections standard. Power leads for an optional automatic oiler and strobe light included with controls. 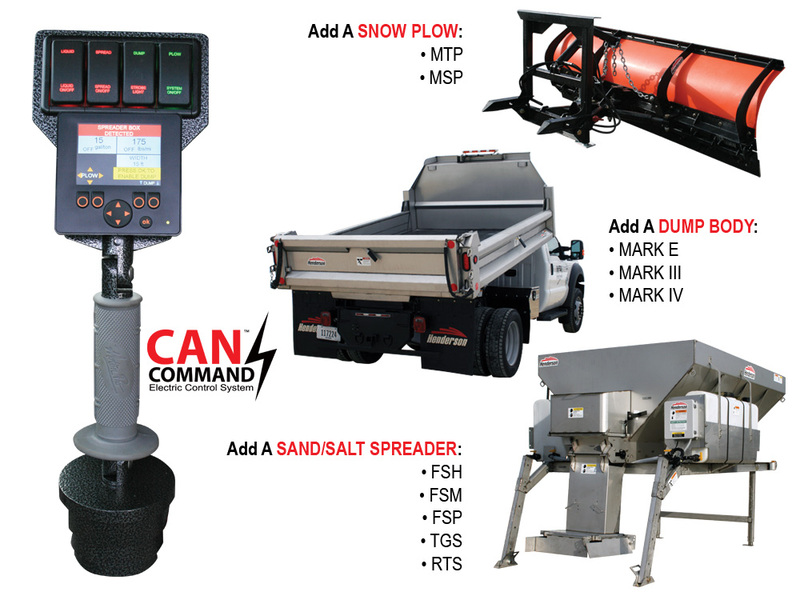 Rates displayed in lbs/mi, gal/ton, and feet of spread for proportional control or 1-10 settings for manual control. 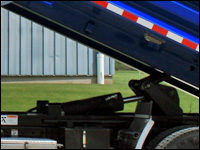 Integral in-tank pump with heavy-duty electric motor powers this unit. 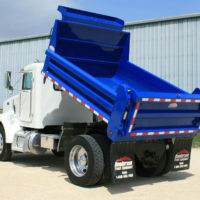 Includes a weather resistant cover and tank shape that allows smooth hose routing. Unit also includes in-tank return filter and oil temperature/level sensor. CAN junction block completely sealed with IP 67/68 connectors. LED indicators on junction block as well as valve allow easy diagnostics. Relief adjustments for plow or entire valve allows adjustment for optimal use.